Patients can use an email to register to a Patient Web Portal. Patient Web Portal enables patients book, cancel and view appointments online, using a desktop computer or a smart device or via an automated telephone system. Web Portal contains a list of future and past appointments and a comprehensive patient profile. One day before the booked appointment, the Portal sends out an email reminder. On request, the Patient Web Portal can also send a text message reminder. Patients can book, cancel and view appointments, both the future appointments and past ones. Sangix contains more than 10 different templates for email and text communication. They are booking confirmation, cancellation confirmation, reminders, password reset and others. Do you prefer phone over internet? Use an automated phone system to book and cancel appointments from the comfort of your armchair or while driving. We are not eavesdropping, but please do be polite to our phone robot, she is doing her best. A calling screen solution is included where patients due are displayed on a screen in a waiting area and those being called in are highlighted and called in by a voice prompt. The calling screen also indicates which cubicle/room the patient is being called from. The actual screen is not included. The calling screen can display custom messages scrolling across at the bottom, these can be modified easily from within the system. Sangix appointment booking is a modern and secure application built with easy and robust integration in mind. We have done number of integrations and thousands of patients use our integrated phone booking to book and cancel their appointments every day. Powerful admin module allows power users to configure number of cubicles/rooms, opening hours and a minute control over what time slots are available to patients booking online which are only available to staff and which are reserved to walk-ins and so on. includes a bank holidays database for two years ahead and much more. 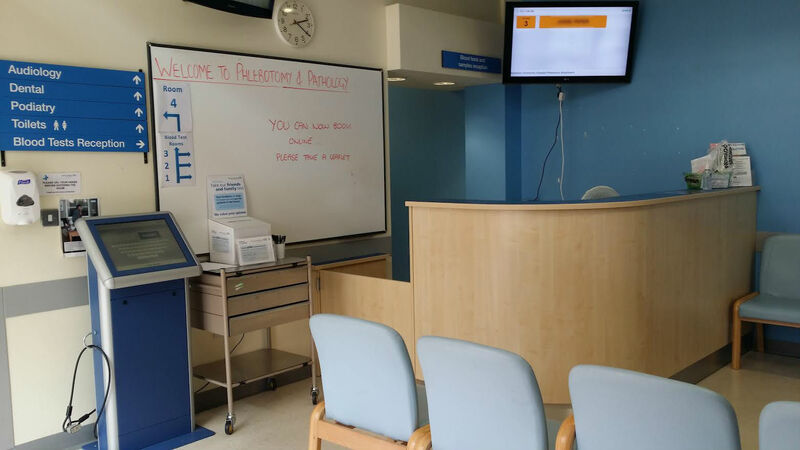 An information kiosk or tablet check-in allow patients to check in once they arrived for a booked appointment. This makes your busy reception available to deal with incoming phone calls or help patients in real need. Patient web portal is an integral part of the system. Patient can register or they can be registered by staff. Once they have an account, they are able to book, view and cancel appointments online, using a computer, tablet or smart phone. Patients can review their past and future visits and update their details in a profile section of the patient portal. There a number of existing reports based on the needs and experience of the existing users. The reports can be viewed online or be exported to Microsoft Excel. The system is prepared for your needs with an easy to create bespoke reports to save your time and energy. A user with a supervisor role can log in from anywhere and view how the unit is doing. They have a big picture overview as well as an insight into how the different phlebotomists perform. That way it is easy to provide support where needed a plan shifts more efficiently. It costs NHS when patients book an appointment and Do Not Arrive (DNA). The system will warn patients if they repeatedly book and do not show up. Also the staff is alerted to such patients and have a possibility to work with them accordingly. While the blood test is usually set to take 5 minutes, Sangix 3 allows customers to configure different “resource types” with configurable time length. This could be used for GTT tests that take longer than 5 minutes within phlebotomy, but could also be leveraged to book appointment in any other department where it is possible to plan time of a visit.